On this date in 1691, Russian Orthodox priest Sylvester Medvedev was beheaded on Red Square. Medvedev was a protege of the great progressive clergyman, poet, and educator Symeon of Polotsk, one of the intellectual champions of the reforming faction of Orthodoxy’s Great Schism. 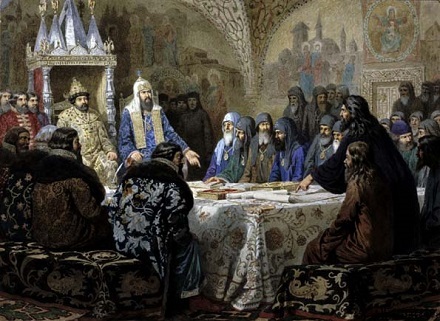 The Schism in question was the widespread disaffection of the faithful (now known as “Old Believers”) for changes dictated from on high whose effect was to centralize the Russian Orthodox church and to alter its services. Patriarch Nikon and Epifany Slavinetsky revising service-books. The Patriarch of Moscow had underaken to revise the liturgy, the prayer-books, and the church services in Russian Orthodoxy in order to bring them in line (so he said) with their proper Greek antecedents. It provoked a furious reaction by Russian traditionalists. Perhaps the most vividly symbolic flashpoint of the Schism was the simple-seeming distinction between making the sign of the cross with three fingers (as the Patriarch demanded), or with two. It was all down to what Nikon said was a mistranslation of the original Greek when the rite had first been established hundreds of years before. 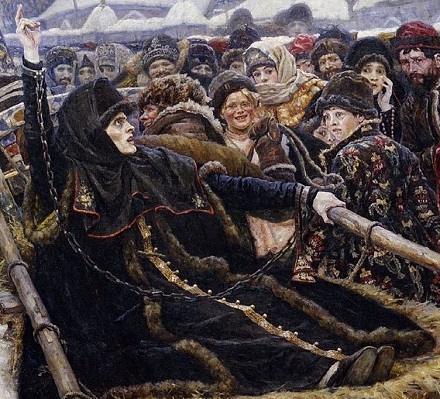 That reform and others were enforced, and opposed, violently: floggings, executions, and desecrations of now-outlaw icons were met by Old Believers willing to mutilate their own hands, or kill themselves, or go to the stake rather than bend. Some 20,000 people are said to have self-immolated in resistance. 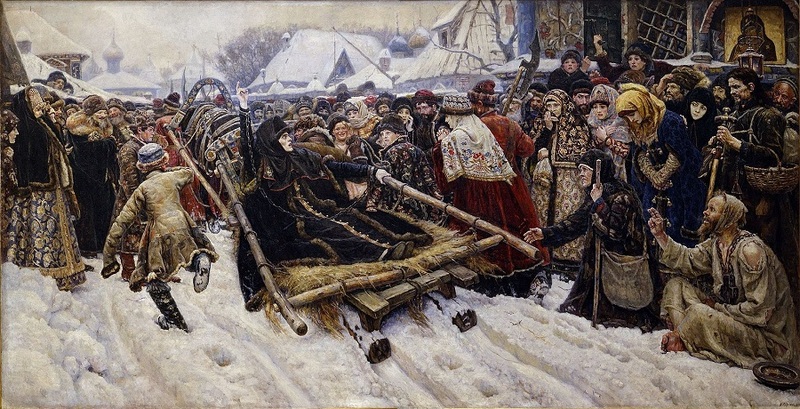 Boyarina Feodosia Morozova concurred with Avvakum Petrov (who was her confessor): in this famous painting of her by Vasily Surikov, she makes a defiant two-fingered blessing to onlookers as the authorities drag her away. Meanwhile, after the death of Symeon’s patron Tsar Alexis, a tense contest for royal political played out during the 1680s. Finally, in 1689, the 17-year-old Peter the Great overthrew the authority long wielded by his elder half-sister, the Regent Sophia. Peter, of course, was not yet “the Great”: he was just a vulnerable kid with a potential legitimacy problem. As one consequence, his mother, Natalya Naryshkina, was able to dictate the appointment of a very conservative patriarch when that post opened in 1690. That man, Adrian, would be the last Moscow patriarch until the Bolshevik Revolution in large measure due to his conflicts with the grown Peter over the latter’s blasphemously western orientation. Adrian was no Old Believer but he bitterly opposed Peter’s attempts to get Russians to dress like Europeans and shave off their beards. And given the ferocity of religious feeling when the stakes are a matter of a single finger, it will go without saying that an inveterate liberalizer like Sylvester Medvedev would have no purchase with the patriarch. This is indeed a strange interim in Russian history; Russian’s great westernizing and secularizing autocrat has reached the throne but with him ascends, just for a moment, the staunchest conservatives ecclesiastics. What was Medvedev up to that got the new patriarch in a twist? If you liked the three-finger thing, you’ll love this: Medvedev maintained that the transubstantiation/metousiosis of ceremonial bread and wine into the body and blood of Christ was accomplished during liturgy by the Words of Institution (“Take, eat, this is my body …”), which was also the Catholic perspective — in contrast to the orthodox Orthodox position that this was achieved by the Epiclesis invoking the Holy Spirit. For Sophia was named wisdom by God. To pursue them, most wise one!